Perhaps you’re looking to achieve outsized gains by putting your money in the next Google. Or perhaps you’re looking to help out your friend’s newly-minted venture. Or better yet, you’re simply a high net-worth individual looking to pick up an expensive hobby. Whatever your reason for interest in Angel Investing, there are a number of considerations to make before you write that first check. In the US, there are a number of ways an individual can invest in a startup. The most well known and lucrative method is to be an accredited investor. This means you’re worth $1M+ in liquid assets or have an annual income north of $200k. That said, if you’re looking to build a serious portfolio as an accredited investor, you’re going to want to have $5M+ in liquid assets. Why? This helps ensure that you can build out a diversified portfolio of ~$25-50k investments without eating up more than 20% of your investable assets. If this amount of capital is out of your reach or you are just looking to test the waters, then equity crowdsourcing platforms like SeedInvest or Wefunder should be considered. In addition to these sites, there are Reg D offerings, where up to 35 non-accredited investors can invest into a company in a given 12-month period as long as total raise is less than $5M. Say you build out a portfolio of 20 companies. Understanding the risks associated with angel investing, you might reasonably assume that 10 end up going under, 5 end up achieving a little more than a 1x return, and 5 achieve a 5x return, making up for those that went under. While a logical assumption, this is not how startup exits trend. Most successful VCs end up seeing 1-2 high performing companies in their portfolio become worth exponentially more than the rest of their fund. Angel investors can expect similar dynamics in their startup portfolio. Over time, investments tend to gravitate towards one of the two extremes, with most going to 0. This can be seen in the chart below and exploration of the power rule done by Peter Thiel and Blake Masters. 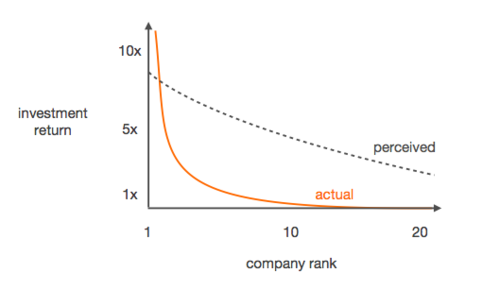 When faced with the reality of investment returns, it’s clear that most all your angel efforts should be focused on getting access to the startup that’s going to achieve 10x, 100x, or even 1,000x returns. This means spending less time on terms sheets that mitigate risk and more time getting access to better deals with incredible founders, real traction, and huge growth potential. Unless you’re well plugged into the startup world, odds are you won’t have access to the deals best positioned to achieve large gains. You’ll either have to pool your social network with others or form a strategic partnership with an existing firm to find good deals. Luckily, there are a number of different tactics to get access to quality deal flow. Angel groups are where groups of angels pool their money and experience together to locate and invest in larger, more lucrative deals. This is perhaps one of the best ways to learn the ropes as you can often sit out of deals and simply observe during your initial time there. An angel syndicate is a VC fund created to invest in one company. They are often lead by seasoned industry experts or firms so most of the due-diligence is already done for you. Joining an angel syndicate is also a smart way to experiment with angel investing, since the money is pooled, you can invest smaller amounts. Stepping outside the realm of typical angel investments, if you’re truly pressed for time, consider becoming a limited partner at a VC firm. Rather than working part-time to try and spot potential home-runs, you can trust a firm of full-time professionals to do it for you. At Venture First, we work with lots of startups and high-growth companies, and we see even more deals. We’re always looking to connect great angel investors to companies we believe have a strong future. If you are interested in learning more about how you can get access to our deal flow, please email steven@venturefirst.com.